Beautiful Vail, Colorado resort! Come enjoy all the outdoor activities! White season week 22! Inquire for details! *Streamside at Vail - Douglas* offers an indoor/outdoor pool for year-round pleasure. Additional resort facilities include a steam room, sauna, whirlpool, and racquetball courts. 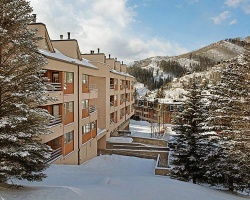 You're two miles from the slopes of Vail Mountain, and the Beaver Creek ski area is only 10 miles west of Vail. Summers offer Jeep tours, horseback rides, hiking, white-water rafting, golfing, and tennis. Vail has many exclusive shops and boutiques, as well as an assortment of fine restaurants and nightclubs to cap off your day. Visit www.marriottvacationclub.com to discover more! *RCI Silver Crown Rated / Interval International Premier Resort* Featuring an elegantly appointed 1 bedroom, 3 bath suite with loft that will accommodate 6 guests comfortably. Usage is annual in white season week 22. For more information or to make an offer, please submit the inquiry form.